Secure Covers' uniquely designed, interlocking weave prevents unraveling, creating a barrier tough enough to help reduce plastic damage - SO TOUGH, COWS CAN WALK ON IT! 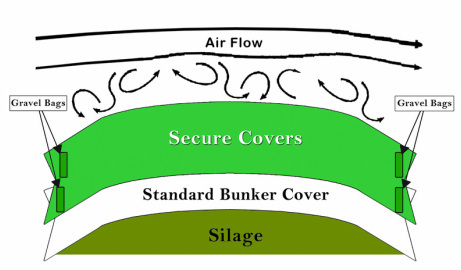 When applied over your bunker/pile/pit plastic, the unique texture of Secure Covers reduces the wind velocity over the surface of your plastic. The decrease in air flow allows Secure Covers to utilize tension to secure your plastic. The tension, instead of weight, improves the silage-to-plastic contact, which is one of the largest contributors to spoilage reduction on the surface of your silage. Secure Covers eliminate hours spent lugging unsightly tires that still leave your plastic exposed to damage from hail, birds, deer, and other animals. "Recently we bought some Secure Covers and gravel bags. We put the covers on top of the plastic and tried to get the covers as tight as we could. We didn't think they would stay tight but when we put the gravel bags on they tightened up the covers even more. I went out and checked on them later and they stayed in place perfectly-just as tight as when we put the covers on. Best of all there has been no spoilage; the quality of our feed is excellent. We didn't buy quite enough covers the first time, but we’re happy with the product and plan to buy more." Helps prevent plastic damage from hail, birds, deer, and more - including cows! "In 2010 we tried the gravel bags and they worked so well sealing the bunkers along the walls and went down so fast, we decided to try the Secure Covers on one of our bunkers to see how well they worked. Well, we were very pleased. The Secure Covers went on very fast and easy and held the plastic down even with windy conditions. Also didn't have to lug all them tires with Secure Gravel Bags. They worked out so well that we purchased enough to cover our other two bunkers." How much is spoilage costing you? Find out with our easy to use Spoilage Calculator! Find out more about Secure Cover for bags and bales on on the Bag Armour® and Bale Armour® pages!